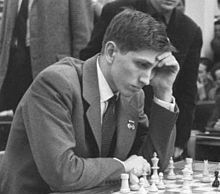 Before the rise of Bobby Fischer, international chess — even among the vaunted Soviets — was sometimes a quasi-amateur affair. Several of the top Soviet grandmasters depended on inspiration rather than diligence and preparation. In a category of his own was the young Mikhail Tal, whose creative flair at the board astonished and terrified foes. Often, he seemed to make up his game as he went along. His moves weren’t always correct, but, in the hurly-burly of struggle, they were effective. He became world champion at 24. At the other extreme were players such as Fischer, Efim Geller and Viktor Korchnoi: harbingers of a more radical work ethic to come, laboring with little respite at the chess grindstone. Mikhail Botvinnik set a new standard for preparation and performance. But it was the young American, Fischer, who raised the professional banner and chess work ethic to its highest level. As he explained to fellow grandmaster Larry Evans, Fischer focused on the game, consciously or unconsciously, 24 hours a day.